Billy Joe Shaver talks straight about music, death, and salvation in his autobiography. Nashville�s most famous janitor could have meant that only in the wee hours of the morn would a tv network dare to air Shaver�s story, a yarn jam-packed with drugs, alcohol, philandering, fisticuffs, and recklessness. Or maybe Kristofferson is simply saying that 4 a.m. is probably the only time somebody could live Shaver�s brutally beautiful life without drawing a crowd. 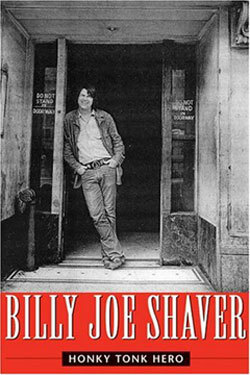 In any case, Honky Tonk Hero, Shaver�s captivating but brief autobiography, makes the argument that Billy Joe Shaver is a larger-than-life figure whose life story has unfolded not unlike a made-for-HBO tragicomedy. Shaver is one of country music�s finest songwriters. His numbers have been recorded by Bob Dylan (�Old Five and Dimers Like Me�), Johnny Cash (�Jesus Was Our Savior and Cotton Was Our King�), Waylon Jennings (�Honky Tonk Heroes�), the Allman Brothers (�Sweet Pea�), and � if this list isn�t mind-boggling already � Elvis (�You Asked Me To�). Even though Johnny wrote that his favorite songwriter was Shaver, and Willie Nelson said Shaver is the finest songwriter alive, Shaver has been stuck with the not-so-lucrative label of an artist�s artist for most of his career. Still, as a label, it�s better than some others that have been dropped on him through the years � drunk, drug addict, and the most damaging to him of all, wife-beater. The son of sharecropping bootleggers in Corsicana, Shaver says he wasn�t even born yet the first time his father tried to kill him. Apparently Buddy Shaver, �half-French, half-Blackfoot Sioux, and one-hundred-percent mean,� thought that Tincie, Billy Joe�s mother, was cheating on him and stomped her with his boots until she lay unconscious. He then threw her into a stock tank to die. �He�d been drinking,� Shaver writes. An old Mexican man showed up to water his cattle hours later and saved her life, along with that of the child inside her. Shaver decided that his songs were as good as Townes Van Zandt�s, his running buddy in the Houston music scene, a Fort Worth native, and author of the country classics �Pancho and Lefty� and �If I Needed You.� Shaver took a crack at the big time � Los Angeles. Nobody picked up the young hitchhiker headed west, so in typical Shaver fashion, he crossed the freeway to eastbound I-10, and the first car picked him up. Next thing he knew he was in Nashville. �There are lots of famous stories about my early days in Nashville,� writes Shaver. �And most of them are true.� Many are re-told in Hero in Shaver�s matter-of-fact style, and all are compelling. Even though it�s been written and talked about a million times before, the Outlaw movement makes for engaging reading through Shaver�s eyes, when he and other inebriated mavericks like Waylon, Willie, and Kristofferson turned a syrupy Nashville on its ear with a stripped-down, honky-tonk sound. The one aching chord that resonates throughout the entire book, though, is Billy Joe�s son, Eddy, and the overdose of heroin that killed him on New Year�s Eve, four years ago. During that same year of 2001, Shaver also mourned the passing of both his wife (whom he married three times) and his mother. Eddy and Shaver were best friends, having never really experienced the typical father-son relationship. (On the other hand, Eddy did have experiences like driving his father�s tour van up the highway when one of Billy Joe�s back-up musicians tossed a beer bottle at a car � he missed � and got fired for his troubles.) Aside from Jesus, Eddy was clearly the light in Shaver�s life. The son also added smoking, jaw-dropping, tear-assed guitar work to his father�s plaintive three-chords-and-the-truth confessionals. But Eddy�s drug habit � forged with Johnny Cash�s late daughter-in-law, Rosie Nix � and his addiction-prone genes proved to be more than he could handle. There are generous portions of straight-talking prose devoted to this relationship. The linear, chronological telling of his survival is slight, at fewer than 100 pages, and is delivered in a clipped, conversational tone that suggests a long weekend of Shaver speaking into a tape recorder and co-author Brad Reagan transcribing later. But it is all proof that the songwriter made good on his promise to God for not taking his arm. A sizable addition to the book includes copies to all the lyrics that Shaver�s ever published, as if to say that, yes, the stories are important, but the songs mean everything. They are humorous, bone-breaking re-tellings in rhyme of his fascinating life and worthy of appreciation � not only because there are some damn fine songs there, but, as Shaver says, �To me, the song is poetry. When I lost my fingers, Jesus made it clear to me that writing songs is my mission in life.� What a life it�s been and a pleasure to read about.